James Zarzana joins Creative Conversations to talk with Yang-May Ooi about the benefits and challenges of self-publishing. 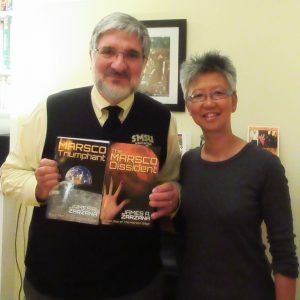 James is the author of the Marsco Saga – www.jamesazarzana.com. This is an AUDIO podcast enhanced with images and video clips. This podcast is part of an audio podcast series Creative Conversations which is available on iTunes. Creative Conversations is the Tiger Spirit podcast exploring – and celebrating – the creative process in the arts, life and business, conceived and presented by author and creative actionista, Yang-May Ooi. You can subscribe to the series via iTunes and listen on your iPhone or mp3 player by clicking on the “Podcast Available on iTunes” button below.